For nearly three decades, Roger Crockett has researched and written about the leadership strategies, styles, and initiatives of senior corporate executives and influential business leaders. As a senior partner at inQUEST Consulting, he leverages this experience to write thought pieces on leadership strategies, diversity in business, and best practice diversity and inclusion initiatives. He also shares this expertise with clients to help them develop savvy leadership, diversity acumen, and strategic communications. Previously, Roger spent 20 years as an award-winning journalist. He served as the Chicago deputy bureau chief for Businessweek magazine, where he wrote several award-winning articles about powerful companies, executives, and the critical issues they face—from digital transformation to diversity and inclusion. 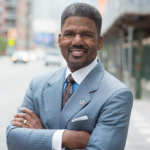 Roger’s trusted insight into business leadership, diversity, and inclusion have made him a sought-after facilitator, moderator, and TV news analyst. Roger is a graduate of UCLA and earned his M.S. in journalism with honors from Columbia University.